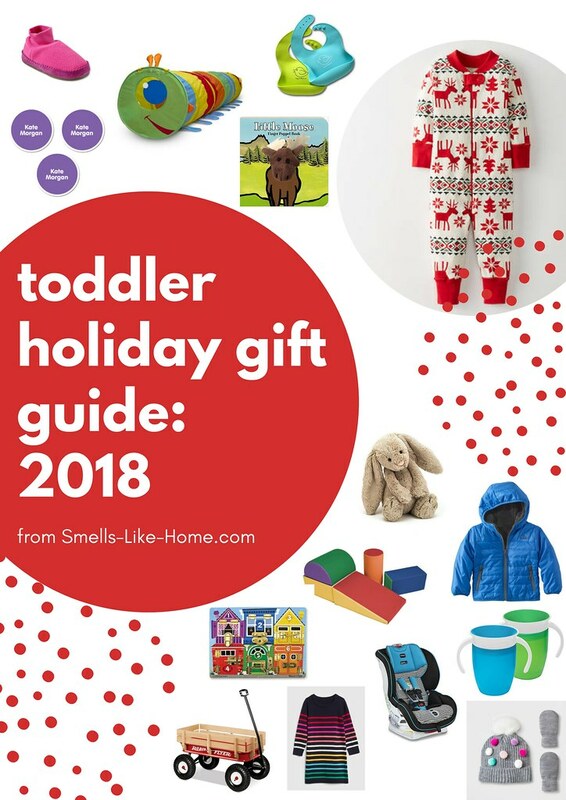 This toddler holiday gift guide for 2018 includes parent-tested and approved items for play, wear, and daycare that are all reasonably priced. This is not a sponsored post of any kind and there are NO affiliate links included here. We just love this stuff and want to share the love with you. Happy Holidays! It’s hard for Kyle and me to believe that Riley is almost 17 months! I feel like I’m going to look back on these posts in 3, 5, and 10 years and be in complete awe that I was one day writing about finger puppet books and sippy cups. I’m doing my best to remain in the moment and really enjoy this time with her because I’ve had so so many friends tell me how fast the time goes. I can believe it. In the next couple of weeks, I hope to write to you with an adoption update (no, it’s still not finalized in the courts) but until then, let’s talk about some of the FUN STUFF she and we have been loving this past year. This humble toddler holiday gift guide includes 15 of our favorite items. Many are very reasonably priced. Some are splurges for us but I’m a coupon code shopper and I rarely purchase items for Riley if they’re not on sale. Some of these items aren’t toys or clothes but I thought I would include them since besides us loving them, I thought they would be great to consider for baby registries or as gift ideas for grandparents. As well and in full disclosure, we have LL Bean and Gap credit cards that we receive points/dollars from our regular everyday credit card purchases towards store purchases so some of these items we haven’t paid for or were heavily discounted because of those points. This financial strategy has been an excellent one for us! And again, nothing here is sponsored and there are no affiliate links included. Anyway! Let’s get this 2018 toddler holiday gift guide underway! Let me know if you have any questions or toddler gift suggestions in the comments below!! Happy Holidays!! LL Bean Toddler Fleece Slippers – These slippers are absolutely perfect for the toddler who refuses to wear socks. They’re as warm and cozy as they look and Riley will actually keep them on for a much longer period of time than she will socks, which last about 28 seconds on her feet. We have 2 pair – 1 for the car (again, socks AND shoes always vanish instantly) and 1 pair for home. Sticky Monkey Peel ‘N Stick Clothing Labels – MUST haves if you’ve got a kid in daycare or going to camp in the summer! These labels stick like glue to all clothing/bibs/blanket/sheets tags and last through months of washing. We just recently bought the meal labels to start labeling her sippy cups and water bottles too (note: these won’t stick to silicone so we held off on them until she was finished with bottles). As a bonus, there’s a 10% off coupon code the site will send you for signing up for their email list. Melissa & Doug Happy Giddy Crawl-Through Tunnel – Riley adores this tunnel! When she was army-crawling early last winter, we kept it bundled in a half-moon shape so it was easy for her to crawl through but now as a full-fledged toddler, she brings a blanket and a stuffed animal in here and she’s starting to use it as a fort. So cute! The best $30 we’ve spent in the past year! Happy Healthy Parent Silicone Bibs – For our self-feeding baby, these bibs were lifesavers! We started baby-led weaning with Riley when she was 6 months old and these bibs caught EVERYTHING she dropped. And the dog loved them too since he got to eat whatever was left in her bib when she was finished! Win-Win! Finger Puppet Books – These books are SO adorable! There are lots of animals to choose from for these books and the finger puppet action still fascinates Riley. We have the moose and the puppy versions and the stories themselves are rhyming joys to read. Hanna Andersson PJs – Guys, these PJs are simply the best we’ve found for Riley. They’re a little on the pricey side but they are well-made, organic, and run large. So the ones we bought for Riley last winter in size 70 (6-12 months) fit her until she was 15 months (she’s in the 50th percentile for height and weight). The up side is that they go on sale often and you can regularly find them for 40% off throughout the year (which is when I tend to stock up in larger sizes). Jellycat stuffed animals – I had these stuffed animals on my holiday gift guide last year and they continue to be my go-to gift for new babies. They remain the softest and most cuddly stuffed animals around and Riley simply adores the ones she was gifted last year. Santa may be bringing another stuffed bear for her this year! 4Kids SoftZone Foam Play Set – As a child ON THE MOVE since she was 6 months old, these foam climbing and tumbling blocks were an excellent addition to Riley’s playroom. She’s been playing on them since she was well, 6 months old – as soon as she was able to move herself around on the carpet! – and they have helped to foster her gross motor skills and burn off some extra energy. The pieces in the set are not attached so you can configure them in multiple ways (though Riley does this herself now). We LOVE these foam blocks! LL Bean Mountain Bound Reversible Jacket – I’m mentioning this coat since it’s very similar to the winter coat we bought for Riley this year. Unfortunately, the exact coat we purchased is no longer for sale in toddler sizes but it’s still available in kids sizes. These are the perfect type of coats for toddlers and kids to wear when strapped into a car seat since they aren’t bulky but still provide a good amount of warmth. They are meant to be worn over layers in cold weather and are very similar in quality yet at almost half the price of Patagonia jackets. Melissa & Doug Latches Puzzle – The locks/latches on this puzzle may be a little bit of a challenge for Riley at 17 months but she loves opening the unlocked doors and windows with her fingers and counting the animals behind them with me. This puzzle fosters fine motors skills in a major way and I’m never against challenging her to try learning new skills. Britax Marathon ClickTight Convertible Car Seat – OK so this may not be a “toddler gift” per se, but if you’re in the market for a new convertible car seat, whether your little one has outgrown her infant seat or you’ve got another kid on the way, this car seat is where it’s at for peace of mind and ease of use. Aside from great safety ratings, we went with this model for Riley because it’s SO easy to move from car to car. The seat simply flips up and you’ll strap the seat belt into place then flip the seat back down. The ONLY downside to this seat is the lack of a cup holder. Not a deal breaker for us but it’s worth mentioning. Munchkin Miracle 360 Trainer Cups – We started Riley with these cups for drinking water when she was around 8 months old and she took to them pretty quickly without lots of dribbles or choking. There’s no spout that can leak or prevent her from drinking with the cup turned upside down so we love them and so does she. Buy the lids too – they’re perfect for preventing accidental diaper bag spills. Radio Flyer All Terrain Wagon – We gave this to Riley for Christmas last year with the plan of her using it when the weather started to warm up in the spring but we ended up pulling her around the house in it for a good part of the winter too, even propped up with pillows before she could sit on her own! She loves being pulled around in this wagon for walks up and down our driveway. She’ll use this wagon for years and years to come! Gap Sweater Dress – This dress is, by far, one of the cutest things I have purchased for Riley to date. I’m a sucker for stripes and bright colors and this cozy sweater dress fits the bill. Paired with some tights and cute shoes, this dress hits alllll of the cuteness marks. As a rule, I never purchase clothes for Riley at full price and Gap almost always has some sort of sale happening so if you hold out for a 40% off sale, this dress is worth the cost, especially since it can be worn for many months since it’s on the long side. Target Pompom Hat & Thumbless Mittens – Target has a giant selection of infant and toddler winter hat and mitten sets and I snagged this one a few months ago in-store. I was a little unsure whether she would tolerate a hat at all so I didn’t want to spend a ton of money on one but since this set was $9.99, it was a no-brainer. Turns out, she LOVES this hat and the thumbless mittens are completely perfect for infants and young toddlers to don’t understand/aren’t able to hold out their thumbs to put on mittens. We LOVE this set all around!! ahhh I love this list! Thanks, Kayle! And YES!! We loved baby led weaning with Riley! She took to it right away and loved smooshing sweet potatoes and avocado into that little mouth.